Although many of our collaborations have taken a while, this has been the hardest and most time-consuming ever. Perhaps because it is so different, and functionality so important. It is a bag and garment carrier in one - and it is called the Suit-Carrier Holdall (or SC Holdall for short). A suit carrier wraps around a central, cylindrical bag, attaching to it with magnets and straps. Because both are made from canvas, and have minimal structure, they can be carried as one bag without being too heavy. But they can also be carried and used separately, particularly at a destination - when you no longer need the suit carrier, for example. It was developed with the wonderful people at Bennett Winch, is made in the UK, and is available to buy now on their site (in either black or olive). Hard, tight folds are what cause creases in tailoring. It’s why folding a jacket around something, such as shirts or knitwear, is a good idea when packing a suitcase. But even better is not folding the jacket or suit at all - and as with the SC Holdall, wrapping it around the case instead. A few brands, including Vitale Barberis Canonico at one stage, have sold garment carriers with a similar idea. They generally roll up into a cylinder, leaving a space in the middle for shoes and clothes. Unfortunately this means the inside has no structure, making it soft and unable to hold much weight. The internal contents also flop out when you unzip everything. I came to the guys at Bennett Winch with the idea of making something similar, but with more structure and in their waterproof canvas. But over the next 18 months - and more than a dozen iterations - they changed, improved and refined the idea into something a lot more original and versatile. We looked at a simple, rolled-up suit carrier, but found it hard to give real room and structure to the contents inside. That design also requires two odd circles of material attached at either end, which mean the carrier can’t be hung up or otherwise used. Much better, it was decided, to have a separate, internal bag, and wrap the suit carrier around it. The problem then is weight. How do you make two bags that are not much heavier than one? Bennett Winch stripped back their normal bag structure to achieve this - the central bag is simpler and softer than their normal Commuter model, for example. But when the two bags are together, the multiple layers of canvas mean that not much structure is actually needed. The only bits that have to be firm are the two ends of the bag. We also realised it was important to make the bag(s) simple to use. If the means of joining them together was too complicated, I can see people not bothering when they’re in a hurry. Magnets were therefore used on the bottom of the central bag, rather than poppers. And on the top, the straps that slide through and fasten back on themselves were refined several times to make them easier to use. Helpfully, Bennett Winch have also shot a video where you can see the whole process, below. Jackets don’t crease; the fastenings all work well; and the weight is no more than most other weekenders. It’s such a lovely sense of accomplishment to make something so functional. And I can hardly take any of the credit - rather like an interested consumer, I have merely said at every stage what I would like and what I would use. The Bennett Winch team have done everything else. It is made in the Bennett Winch 24oz cotton canvas, which as I have written previously, has a lovely handle and is waterproof (being actually two layers of canvas bonded together). The leather sections, such as the panels on the bottom of the bag, are all veg-tanned full-grain leather. The suit carrier comes with its own slimline, wooden hanger but can take any regular, flat hanger. It is designed to accommodate one jacket and one pair of trousers. The suit carrier has one, zipped external pocket. The holdall has no internal or external pockets. It also comes with a shoulder strap, and a removable waterproof section that fastens inside the central bag. 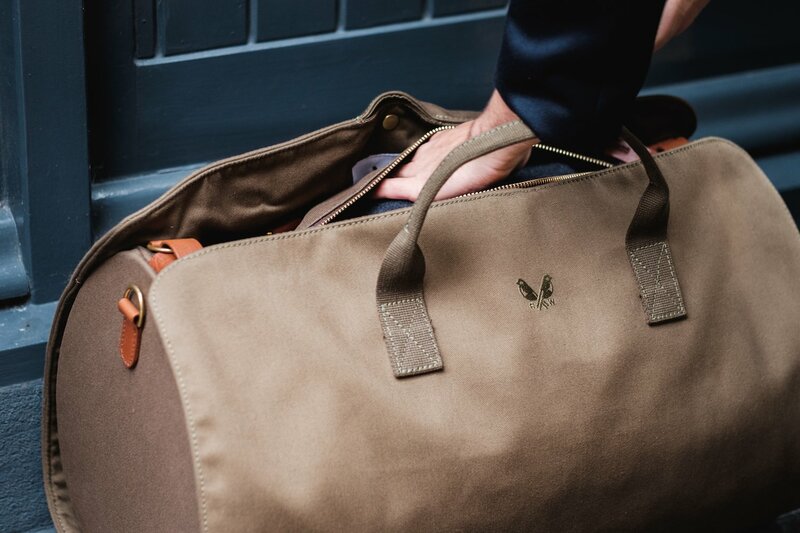 The Suit-Carrier Holdall is available to buy now on the Bennett Winch website - not the Permanent Style shop. There will also be a few bags in the pop-up shop, which opens on November 15th. So you can see and try it out there. Thanks everyone, I really hope you like it. You can follow the discussion on Introducing: The Suit-Carrier Holdall by entering your email address in the box below. You will then receive an email every time a new comment is added. These will also contain a link to a page where you can stop the alerts, and remove all of your related data from the site. Are A&S trousers bespoke or Haberdasherey? So when you have the suit carrier wrapped around the bag, there is no protection on the “base” of it; how does that work when you put it on the ground? You mean there is no protection between the ground and the suit? That’s fine, the robustness of the canvas, and its bonded construction, is easily enough to protect it, and as it is wrapped rather than folded, and fairly taut, it doesn’t crease. Normally any case or bag, no matter its construction, will have feet or studs to stop it coming into direct contact with the ground. Yours doesn’t. So eg it can’t be put down on a damp surface. It can actually, because the canvas is waterproof – as explained in my previous post, it is actually two layers of canvas bonded together, in the same way a Mac is made. Feet or studs are less about being on a damp surface, because the middle of the bag will always touch the ground. They’re more about avoiding wear and tear on the corners, which was one reason it was decided to add the two leather sections on the bottom of this bag. nice holdall. how do you compare it with vocier c38? does it also get fiddly in the central section? No, I think that’s one of the nicest things about it. It’s not fiddly, it’s simple and intuitive. The Vocier things were nice and innovative, but just weren’t intuitive for me. Thanks. Do you know if this bag is heavy? Would it be hard for a woman to carry a full bag around? The bag itself isn’t that heavy, no. Like pretty much any canvas holdall, it depends how heavily you pack it. I find, for example, that most holdalls I will pack fairly light unless im traveling by car. I got one for Christmas yesterday, and it is very much a beauty! But I find it to be fairly heavy, to be honest. Still, great idea and superb execution. Have they done away with the shoe compartments in the process of slimming the bag down? Shame. Do you have any pics of the inside of the bag? Surprisingly there aren’t any on the maker’s website. 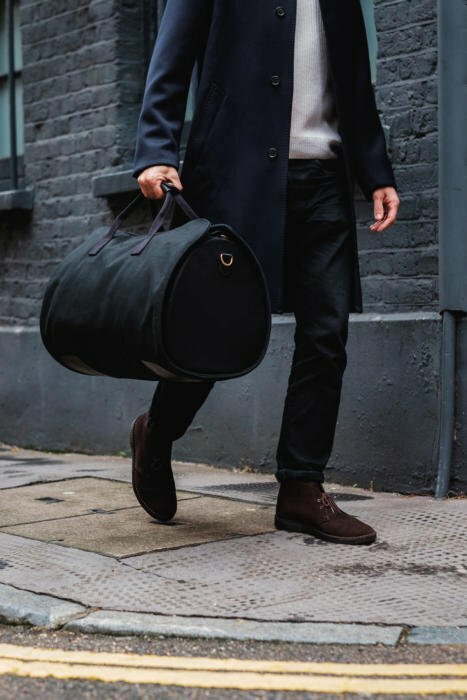 No, the bag is similar to their Commuter in that respect – it has a shoe compartment (waterproof) that is buttoned into the inside (and is therefore removable). It’s a really nice feature. Only the much larger Weekender has the shoe compartments that zip open from either end. Great looking bag and great function for travel. Forgive me if this information is in the write-up (I’m reading this over the 1st morning coffee so I’m not reading at full acuity)—does the bag fall within and meet carry-on specs? The specs shown on the Bennett Winch website are 55 by 36 by 45 cm. BA quote 56 by 45 by 25 for cabin baggage. EasyJet are similar. This seems to exceed that. May be worth a double check. Perhaps the BW website is wrong. 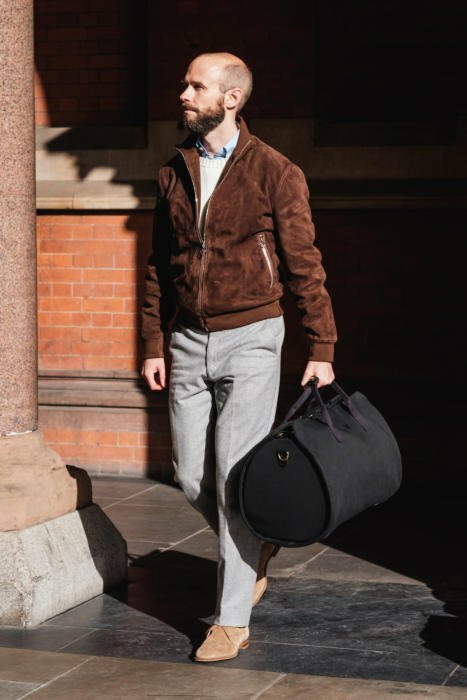 This is genius – can see this working particularly well for a weekend away when you may want to travel casually, but want a jacket and more formal trousers for the evenings. Very well done! I was actually planning to get the commuter bag in order to have a small, light holdall for short trips. Would you say that this holdall (without the suit carrier) is roughly the same size as the commuter one? Would it be ok to use the holdall alone much more often than with the suit carrier, or will wear and tear damage the bag’s ability to link-up with the suit carrier? Yes, it is about the same size. You could certainly use the holdall more often and it wouldn’t damage its ability to link up with the suit carrier. But be aware the holdall is simpler in construction than the commuter too, eg without the brass feet. A great bag still, but without the frills. Hi Simon, can it be carried in the airplane cabin? Is there a way to buy the suit carrier separately? The nominal dimensions are much bigger than the commuter (55 x 36 x 45 vs 49 x 26 x 28) and therefore it will not work as a hand baggage for majority of airlines. Could you say if the bag is stiff or can be somehow compressed if it is checked during boarding? That’s a very good point, and the guys are actually going to update the site now to reflect it. 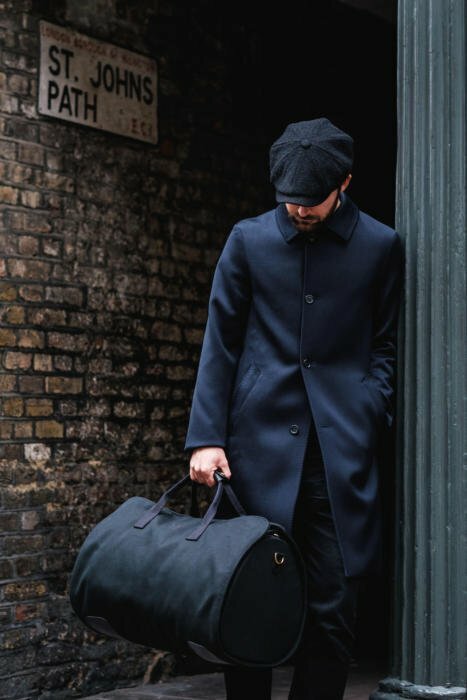 The measurement of the height of the Holdall is misleading, as it includes the handles fully upright. If they were folded down, as they are on the measurements of other bags, the height would be 32, which is much more within most airline guidelines. Also, you’re right that being canvas, it can be compressed quite a lot. Unless it’s rammed full, there is always some room there, unlike a hard case. And there are three or four inches either side beyond the width of the hanger, so there is no danger of crushing the suit. The bag was used by the guys on several airlines as part of the testing, with no issues. Only something like Ryanair, which has silly requirements, won’t work. I note that many North American airlines limit the height to more like 25 cm, so much less than even the corrected height of 32 cm. It may still fit with compression, and lax enforcement by airlines. No, I’ve never posted on it. Unfortunately Seraphin only retail in very few places – they are mostly just a manufacturer for other brands. There is a handful of shops, and places like The Hanger Project sell some pieces too. Do you mind sharing where you were able to get this particular bomber jacket? From Seraphin in Paris, during a visit to the factory. They do generally allow such visits from the public, and commissions to be made once there, although they don’t publicise it. Contact them and ask. I note the hook of the coat hanger doesnt come through the suit carrier. Was that for a reason? Is there a way to hang the suit carrier part of it in a wardrobe or on a door etc without trying to hook another coat hanger through the handle? No, it does actually. The hook can be pulled through a gap in the top, and therefore hung up. In which case I’m surprised that you duplicated the handles on the suit carrier part rather than have the holdall’s pass through it. If you did that the two bags couldn’t be carried separately. Well, technically you’d have the two slots to pass the bags handles through which could effectively be used as handles or you’ve the hook of the coathanger. Though I wonder how many will carry the suitcarrier as a bag on its own. Very nice, Simon. What’s the blue coat and brown suede shoes in the other pictures? The coat is from Private White, I know that. I’ll get full details on Ru’s outfit now. A create-proof traveling bag is something of which I am much in need! You write that it can hold one suit. Is it possible to fit two suits in it? Or is there just no room for that? I wouldn’t put two in, no. No, indeed. The shoulders would suffer, among other things. Anyway, congratulations to Simon and the Bennett Winch team. This is a truly creative solution to luggage dilemmas. Yes, another pair of trousers might be OK, but generally I’d avoid it. I see, the carrier’s probable roomy enough for just a trouser + jacket pair to remain neat. Remembering your post on wearing heavier cloths, this is probably an amusing measure of the quality of one’s suits: if two pairs of a man’s trousers can fit in without wrinkling then the materials are much too fine. Sorry if I’m asking these questions despite not being in a position myself to get the bag. Hoping others pick up on this exchange for proper ways to use it. Absolutely genus! Well done all! I have been looking for something like this for years. Is it comfortably big enough to take a suit on a decent hanger without creasing? Very nice. When the suit carrier is used with the bag inside, it seems that it is the former’s handles that are used and not those of the inside bag. Is that right? Doesn’t that mean that the whole weight of whatever you have inside the bag (including heavy things like shoes or books) rests on the top of the suit when you carry it? Very slick. I just ordered the olive. What a great idea. Hats off! The design seems fine, the quality of maufacture high but at £650 it is more than a Tumi (the most expensive executive luggage brand – high overhead in marketing and R&D) high tech composite carry on. Cotton canvas, though rugged, is simple and cheap to manufacture. I applaud your developments and efforts to grow UK production but I figure, at a minimum, that the cost is £200 above where it should be. Some may be drawn to the unique aspect of low production numbers and useful design but it seems to offers little in the way of a luxury product nor does it offer very good value for money. I’m sorry, but that’s simply not true. There is a huge difference in costs of canvas, and canvas of this weight, double thickness and bonded, is expensive. You could not produce something like this in the UK, with this level of detail and functionality, to sell at anything like £200 less. And that’s without considering the past 18 months of work, testing and prototyping. Simon you’ve outdone yourself yet again. Your ability to fill holes in the market with well considered, high quality and practical products is amazing. My only difficulty is choosing the colour. 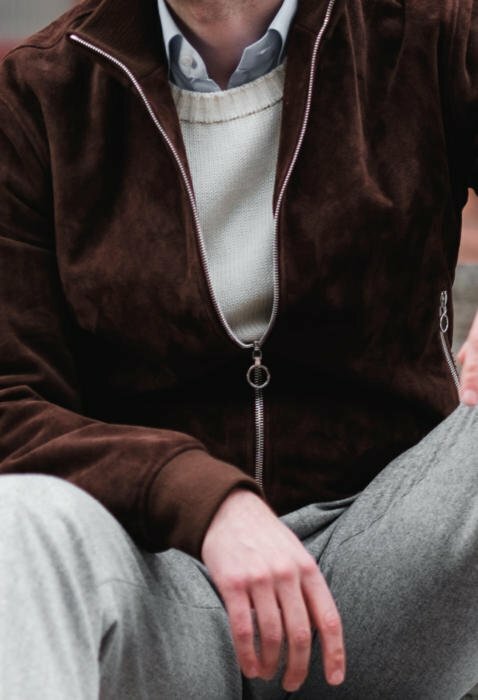 I thought the black was navy when I saw it on Instagram which made khaki an easy choice, but I’m no toying with black..
By the way….the cap…is it the Bakery Cap from Lock & Co? Do you plan to eventually release in other colors aside from black and olive? 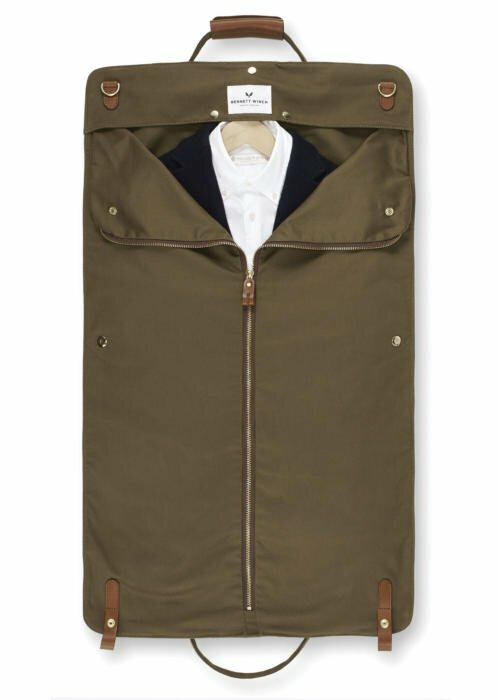 This is a particularly handsome version of an old idea: a garment bag that wraps rather than folds. At university (quite some years ago) I used a “convertible duffle” by Golden Pacific. Other models I see at airports quite a bit include the “hybrid garment bag” by Code Alpha and the particularly ugly Skyroll Garment Bag. In my experience, these bags are only marginally better at preventing wrinkles than the more common folded variety. The problem, even without the middle fold, is the lapels, which crease dramatically with the slightest bend in the carrier. Anything but heavy woolens have required a post-flight pressing regardless of bag style. I’m also concerned that handle-to-bag connection on the suit carrier, a canvas-to-canvas connection made with just a box stitch, will suffer durability issues. While I like its minimalist look, I’ve had past issues with even leather-on-leather connections of this type and now favor full-length stitch connections like that on the zip-top Clegg briefcase that you’ve showcased in the past. 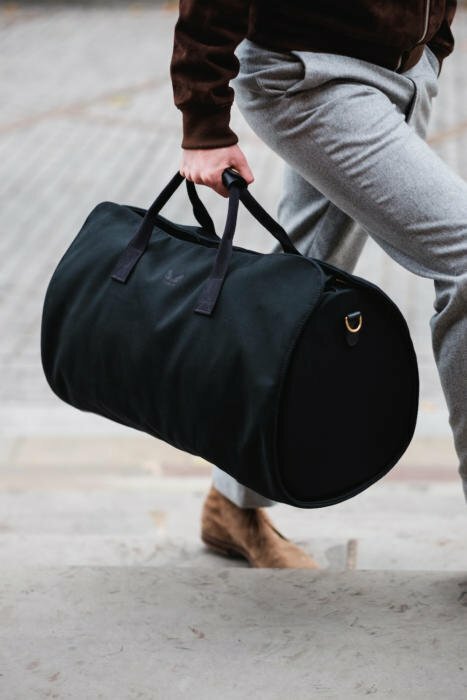 The problem seems particularly acute in this case as this canvas-on-canvas connection is meant to take the full weight of the full suit carrier plus central bag combination and as BW is a relatively new company without a track record of durability. Perhaps offering buyers a lifetime repair warranty will ease some of these concerns. Do you know if there are any plans to make it in navy? A bit of an unrelated question, I have noticed that over the course of the blog that you have used both Globe-Trotter and Rimowa suitcases. Are you planning to review both or do a comparison of the two? It would be very interesting to hear you takes on both brands and your opinion into what makes for a well crafted and durable suitcase. Brilliant – I have been looking for something like this since forever. It actually stands for ‘suit carrier’ holdall, but I can see why you might think that! Love it, ordered – thank you! Looks like a great idea. I have one on the way……. Simon, how do you store your bags when not using them? Do you put something inside to help them hold their shape? congratulations on this beautyfully made, and well designed Suit Carrier. Like a previous contributor said, you filled a gap, that was almost vacant, for all the gentlemen travelling out there. On a side note i want to express you my sympathy and my astonishement about the fact, that you somehow manage to keep your cool, after so many silly-nerdy-repetitive questions. I always thought you might sometimes, be a tad pedantic on some (very few) of your answers, but i now understand why it might have appeared so, by reading the 57th question about the carry-on luggage, or how many grams of pressure the handles will support at 10 000 feet, in a middle of barrel-roll. The visuals look like you have not put a suit in the carrier or if you have it’s wafer thin. Would it handle your A&S cord and still look like this ? Also, what would the bag typically hold without overfilling ? Wash kit, 1 pair of shoes, 1 sweater, 2 under wear, 2 socks , 2 shirts ? It might be handy to post a video showing a complete packing exercise. I have the VBC bag which you mention in the post and it works well (no creasing), but this looks better. Well done. Will you have any samples to view in the pop up shop? Thanks for your points, and very useful context. Simon, I’m honestly very impressed by your concept. However I also have to admit that Mr. Anonymous here has a point. The charm of PS has always been the transparency of information, of which there is little to be found in the world of menswear blogs, and which you have striven so hard to provide. Readers place their trust in PS content, because they know Simon has done what he can to provide a fair and comprehensible review of whatever sartorial items are covered. Which is why, the lack of critical assessment in this article (and the comment section here) worries me. 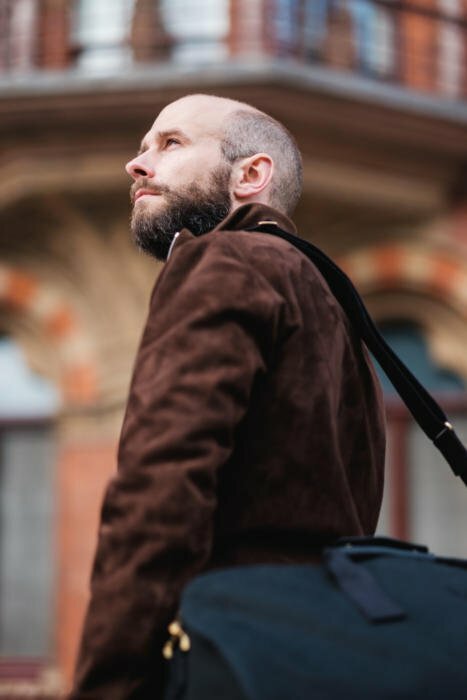 The holdalls have certainly sold well, but so far no buyer has come back to provide reflection on their actual use experience. And the article itself focused more on the development journey of the piece, rather than Simon’s actual use experience and results. IMO, it would be valuable to have a coverage piece on your actual use experience – for example, which trip did you use it on, how did the capacity suit your particular trip, what items did you pack, how the weight felt on your shoulder, and lastly but certainly not least, how did the suit fair after an extended transport to the destination. Good point, and I’ll certainly try to include that on future posts on products. I checked the market re. your price. 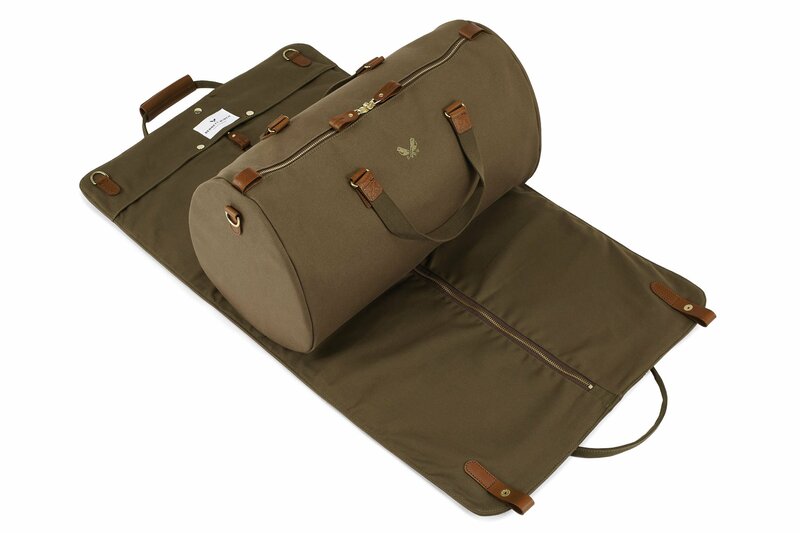 In fact it sits fairly within comparitive offerings of high grade canvas holdalls. It is priced higher than single bags but with the inclusion of the garment carrier the uplift seems fair and offers greater flexibility, capacity and practicality than any other rival. So yes, it does offer value for money! I want to see a video of this rig fully loaded before I make my mind up. 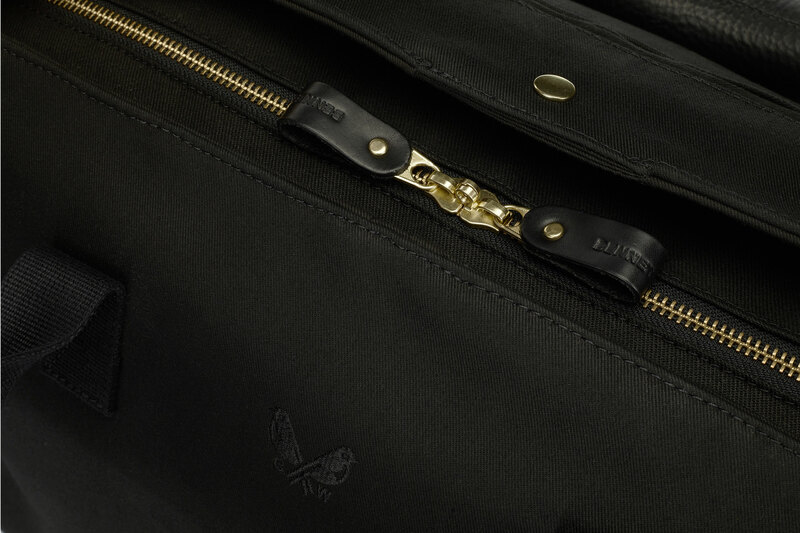 Most bags look great when they are empty – this is particularly true of suit carriers. What is the largest size jacket this can hold? Most carriers arr too short meqning you have to fols the jacket up anyway. Also, please make one that allows a shirt, jacket and trousers rolled together which will stop your shirt getting crushed by everything else in the holdall. I bought one for a weekend trip to Paris. I completely packed it brimming full, as I thought filling it would be better for keeping the suit un-creased. Of course, it was then massively heavy, and I yearned for something I could push or pull. So my question is, how full does the bag have to be to retain enough structure for the suit to remain uncreased? The suit came out brilliantly by the way, but my neck and back not so much! Hey Matt. I wouldn’t worry about packing the bag that full – I’ve carried it empty and the suit has been fine. 2. The quality of the bag is great and looks like it will last (no doubt the quality of the materials does add a little it the weight). 2. The bag is heavy when fully loaded, especially if you have a laptop etc packed but I find it fine on the shoulder strap. The challenge is if you want to take two suits/jackets (wear one and carry one), then you can’t use the shoulder strap and the bag is very heavy which is fine if you don’t have far to walk are taking taxis around etc. But back breaking and sweaty(!) if you have to walk miles. 3. If you fly business a small bag on wheels and the holdall is ideal for a week and you can carry the holdall on top of the wheely bag whilst walking! But I hate checking in luggage so might overweight this benefit vs others who prefer one big suitcase. I’d conclude by saying it does what it’s made for very well and is perfect for a weekend away with a jacket, or a business trip with one suit/jacket. Like all luggage it can’t do everything and there are trade offs (weight, wheels, size, need to check in etc). If I could make one change, I’d like to be able to fit two jackets in the carrier. I assume you tried that in the design process and it didn’t work? Hopefully this will be a helpful and balanced real world summary! Thank you for your feedback Rob, much appreciated. We may look at an XL version to carry more than one suit in the future, but for now this design (and the materials we used) lent itself best to a 1 suit carry. All the best and do stay in touch. After having used the suit carrier holdall for some weeks (on a daily basis, given I am on the road most of my time), I can say that its light, a great design, and best of all Bennett Winch have stellar service: when one button came off, Robin (Nennett) responded within less than a day and offered not only a repair, but a replacement suit carrier. Thank you for taking the time to post. Very pleased you are enjoying using your SC Holdall and that you are happy with the service we provide. I’ve coveted the SC holdall since it was first released and finally took the plunge earlier this week as i’ve a couple of short trips coming up in the next month. Build is beautiful, lovely quality and a great looking product. I’ve not tested out the full functionality of the suit carrier element yet, which was where i was/am most sceptical as i wear a 44L jacket so worried it wouldn’t be able to comfortably accommodate jackets of my size but will give it a bit of a road test and see how it fares. Thank you for taking the time to come here and comment. Look forward to hearing how it performs on the road-trip! One month on – 5 flights, 3 hotels, tubes, taxis and trains – I think it’s had a pretty reasonable roadtest. Holdall come suit carrier the SC Holdall is just perfect and really fuses form and function. Delivery, presentation and build quality were all just great, and cement the ethos of buying great quality and designed products. Really pleased with my buy and certain it’s a bag i’ll be using again and again for years to come. Well done Simon and the Bennett Winch team. I’m curious how you feel about the new leather version now being offered. It looks much smarter and seems that the brown option would patrinate beautifully, but I worry about the added weight. Do you feel that the trade offs are worthwhile? Or does the weight and weatherproofing make the canvas more practical? I would love to compare them in person, but I don’t imagine that either option would be stocked in the US. Few things to mention here. 1. We only use leather to wrap the entire outter section of the suit carrier. The Holdall and other elements are the same as the all canvas version. 2. In terms of weather proofing, the canvas one has bonded (fully waterproof) canvas where leather now sits so both cause no issues with being weatherproof. 3. Because of the fact that bonded canvas has a rubber membraine in between two 12oz layers of canvas, it is actually not that dissimilar to leather in terms of weight. This is especially true when we split the leather down a little to reduce the weight (while staying plenty thick enough to be durable). For this reason the leather version of the SC Holdall is actually only 0.23kg heavier than the canvas version. The difference side by side is barely noticeable. What are your thoughts on the Brunello Cucinelli suit bag? I know it’s far more costly than this bag, but I’ve wondered if it would be as effective and efficient as other suit bags. I haven’t seen it close up I’m afraid. Very interested in this bag. 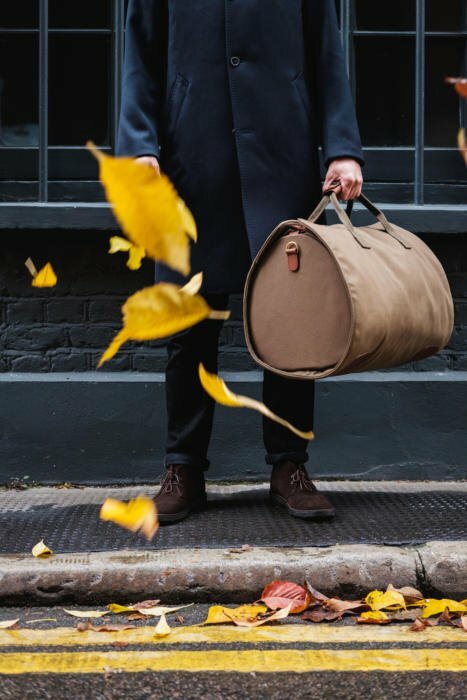 It’s a great design idea, but I’m a little concerned that the pressure on the suit jacket caused by wrapping the suit carrier around the bag might result in crushing the shoulders or the roll of the lapels. Thanks, Simon. That’s helpful. One of the great strengths of PS is being to benefit from your experience and that of other readers. I’ll pop into the B-W showroom when I’m back in London in the next week or two, to see if they have examples I can look at. Hi Simon, sorry to dig up an old post – can I get the details on the darker brown (crepe soled?) chukkas/desert boots pictured above? Definitely not anything from Edward Green!